MANILA, Philippines - A huge fire destroyed three buildings at the University of the East (UE)- Manila on Saturday morning, April 2, 2016. 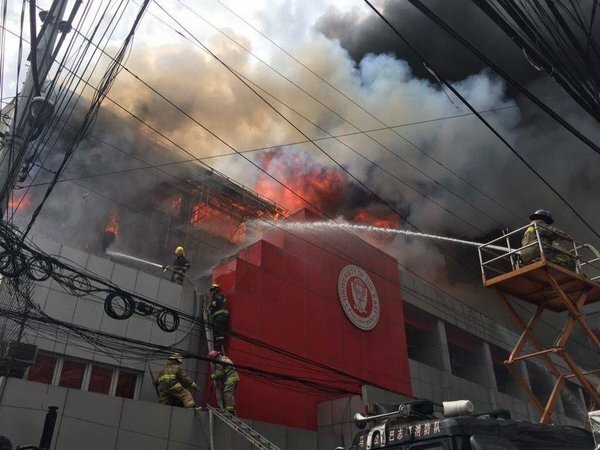 Fire hits University of the East (UE) campus in Recto, Manila. Photo shared on Twitter. Emergency dispatch server TXTFIRE Philippines reported that the start of the flame was at 9:35 a.m., moving up to Task Force Charlie level or eighth highest alarm level as of 10 a.m.
UE's student publication The Dawn said the fire broke out from the second floor of College of Arts and Sciences (CAS) and has destroyed the CAS, College of Engineering and the University Chapel buildings. The official student organization of Journalism students of UE added the fire is now under control. There have been no reports of casualties during the incident. The Bureau of Fire Protection, however, estimates 22 million worth of damage to properties, GMA News has reported. The Bureau of Fire Protection (BFP) Senior Fire Officer 2 Sany Lacuban told CNN Philippines that the cause of fire is still under investigation. Initial report said there were welding activities in the area. BFP officials say they will have to check if the UE administration has acquired hot works permit for this. The heartbreaking news occurred a day after the Faculty Center building at the University of the Philippines in Diliman, Quezon City was similarly hit by fire. Meanwhile, "UE Manila" and "#PrayforUE" trended on Twitter Philippines as concerned students, alumni and netizens expressed concern over the incident. University of the East (UE) is supposed to be the testing center for April 3-5, 2016 Electronics Engineer (ECE) board exam. The Professional Regulation Commission (PRC) already released changes and updates on venue and room assignment.